Opal was first discovered in Ethiopia in the early 1990s. Specimens from Mezezo in the historical Shewa province consist of nodules of a reddish brown volcanic rock with orange, reddish brown, or “chocolate” brown precious opal inside. The next major discovery occurred in 2008, when white precious opal was found in the province of Wollo near Wegel Tena, about 550 km north of Addis Ababa (F. Mazzero et al., “Nouveau gisement ďopales ďEthiopie dans la Province du Welo: Premières informations,” Revue de Gemmologie a.f.g., No. 167, pp. 4–5). This deposit still produces large amounts of white and crystal precious opal and occasionally some black material (Winter 2011 Lab Notes, pp. 312–313). 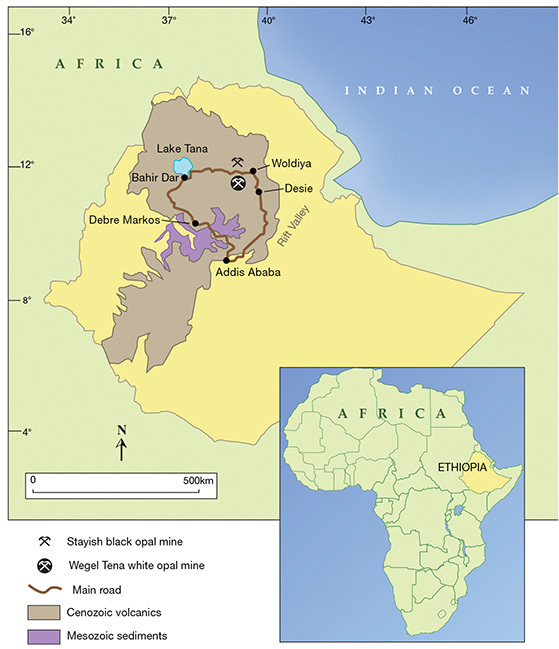 In 2013, yet another source was discovered in Wollo, at the Stayish mine near the town of Gashena (figure 1). This discovery has yielded mostly dark and black opal, along with some white and crystal opal. Although it is only now being reported, the deposit has been actively producing since 2013. It is set in a distinct opal-bearing layer in a mountainous area at an altitude of around 3,000 meters. It lies approximately 700 km northeast of Addis Ababa, more than 100 km from the historic town of Lalibela by road, and about 30 km north of the white opal deposit. Figure 1. The Stayish black opal mine, active since 2013, is located in the Wollo province of northern Ethiopia. 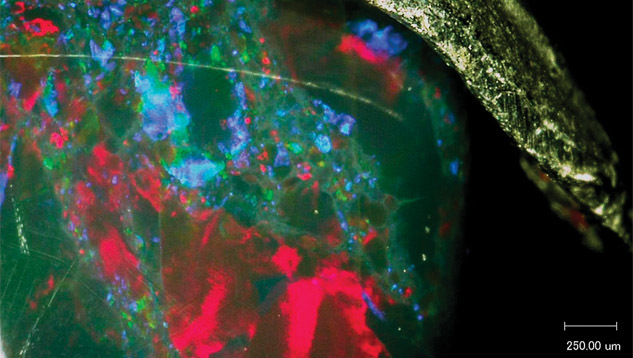 Like the white opal, the black opal is found at the contact zone between the volcanic rock series and the underlying clay-rich layer (figure 2). The layer is one in a sequence of repeating volcanic ash and ignimbrite layers. Field observations at different locations show that the opal-bearing layer is contained in a single stratum extending for tens and even hundreds of kilometers along the mountain belt. The opal-bearing clay layer is about 60 cm thick and contains opal of various quality and color. The black opal is retrieved from flat tunnels up to 15–20 meters long that are dug horizontally into the mountain slope by local villagers. The material generally comes in nodules and chunks 2–5 cm long, but 10 cm pieces have also been retrieved from this deposit (figure 3). Figure 2. While acidic ash layers occur repeatedly within the stratigraphic sequence at Stayish, precious black opal occurs only in this stratum. Photo by Pierre Hardy. Figure 3. 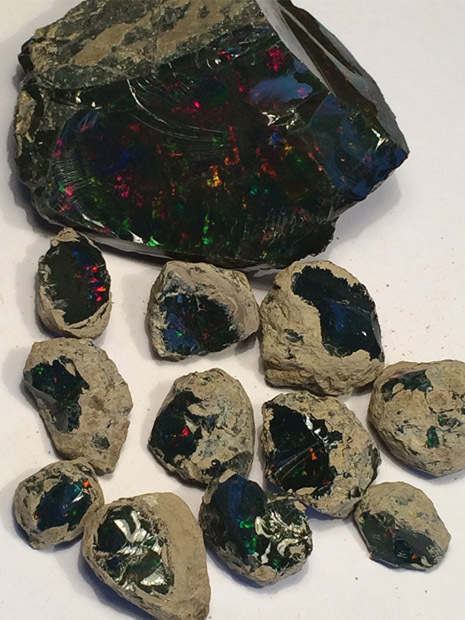 Pieces of black opal from the Stayish mine are usually 2–5 cm in diameter (bottom), though some may reach 10 cm in length (top). Photo by Tewodros Sintayehu. The specimens are usually very dark, reminiscent of dyed or smoke-treated opal except that the surface does not show any staining in surface pits or fissures (figure 4). The stones also display a dark, even color all the way through and are sometimes layered with dark gray common opal. This separates it from sugar-acid treated opal (Winter 2011 GNI, pp. 333–334), where the darker color is confined to a more or less thick surface layer. Figure 4. This microscopic image of an Ethiopian black opal with surface scratches shows none of the black staining seen in smoke-treated or dyed opal. Some grayish non-precious opal material can be observed between the color patches. Photo by Hpone-Phyo Kan-Nyunt. Initial X-ray fluorescence analyses showed barium (Ba) values ranging from below detection limit for one deposit with more crystal-like opal to 1000 ppmw for another deposit with more dense and grayish material. 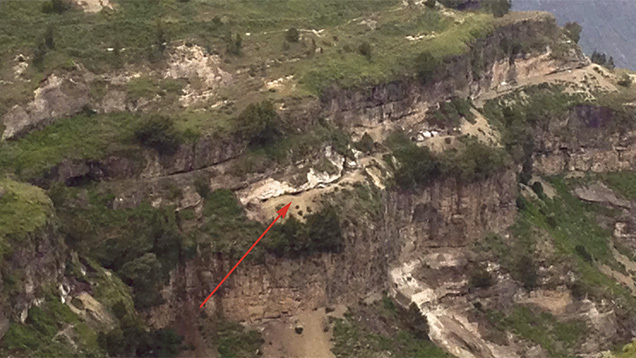 The two deposits are on adjacent sides of the same mountain. The wide range of Ba values confirmed the volcano-sedimentary character of the black opals, as previously described for white opals from Wegel Tena (B. Rondeau et al., “Play-of-color opal from Wegel Tena, Wollo Province, Ethiopia,” Summer 2010 G&G, pp. 90–105). Preliminary studies with Fourier-transform infrared (FTIR) spectrometry did not give conclusive results due to the relatively opaque character of our samples. Raman spectra showed very strong carbon peaks, though these alone do not allow a reliable distinction between treated opal from Wegel Tena and natural-color black opal from the Stayish mine. Careful microscopic observation should reveal the natural character of opal from this new deposit, and further studies are in progress. Lore Kiefert is chief gemologist and Pierre Hardy is senior gemologist at the Gübelin Gem Lab in Lucerne, Switzerland. Tewodros Sintayehu and Begosew Abate are with of Orbit Ethiopia plc in Addis Ababa. Girma Woldetinsae is director of research and development for the Ethiopian Ministry of Mines, as well as president of the Ethiopian Geoscience and Mineral Engineering Association (EGMEA). The authors thank Mr. Bill Marcue from D.W. Enterprises for helping to finance this trip, as well as the Ministry of Mines of Ethiopia and the people of Wollo for their kindness and support.